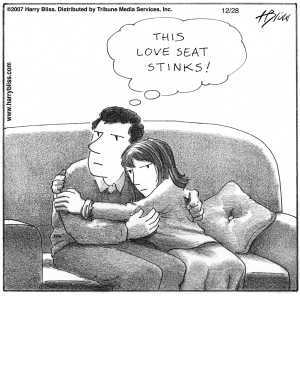 Love Seat Stinks | Comics I Don't Understand - This site is now being updated daily at http://www.comicsidontunderstand.com. Please change your bookmark if necessary, and notify any web site with a link to the old address. Judging by their expressions, they’re not in love. It follows that the “love seat” has failed them. I agree – but when I first noted the way he’s looking away from her and how his nose is tilted up, the first thing to pop in my head was “cat pee”! 1.) Love seats are for loving and cuddling for two, but the seat is not shaped correctly, thus it’s not doing anything to help the loving. 2.) The phase “this love seat stinks” alludes to the phrase “love stinks” (also a song by the J. Geils Band). I think “stinks” is meant only figuratively here. That love seat ain’t workin’. I took it one step further and thought that it “stinks” because they’re not MAKIN’ tha love on the luuuuv seat (just cuddling), and he clearly feels there was some false advertising here. It’s still kinda dumb. You know what else? My universal remote has failed to change the universe. And there are no men for sale at a Big and Tall Men Store. What a gyp. He’s pissed off because now his wife’s made him get a “love seat” he can’t watch TV or just relax without her smothering him.